It is hard to believe a month has passed by already! Matthew and I were carefully delivered to South Georgia on 12th October via the MV Pharos. Matthew was ecstatic to be back on terra firma and I felt blessed to be returning to one of the most remarkable places on the planet. We completed biosecurity, briefings, inductions, training and tours in the first few whirlwind days and moved into the museum accommodation house. 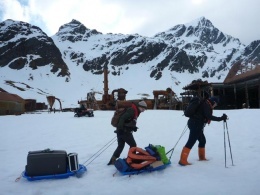 This was done via a boat ride across the bay as the track was still covered in snow and we needed to drag our belongings via sleighs across the snow to our front door. That certainly was a new experience! After settling in, we were finally able to concentrate on our roles. Sarah had done an amazing job biosecuring the majority of the shop stock and museum supplies that had previously arrived so there was only a fraction left to complete. Using a tractor, enormous trailer and a team of six, this was transported from the base to the Museum where the next week saw it unpacked, counted, stored and displayed for the upcoming season. Matthew de-winterised the museum by putting up the necessary signs and re-displaying artefacts that had been stored for the winter. He also tried to get his head around the long list of jobs lined up for the season and deciding which ones he was to tackle first. 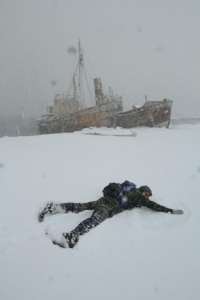 One of his main aims this season will be to create an exhibition on the centenary of the voyage of the James Caird from Elephant Island to South Georgia and the first South Georgia crossing. 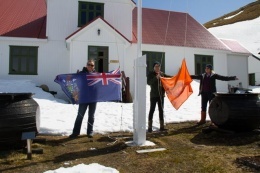 The team raised the South Georgia and Museum flags on 21st October which felt like an ‘official opening ceremony’ for the season to come. Matthew and I used an old whaling station wheelbarrow to put out the heavy, stainless steel information signs and had many laughs along the way. The winter snow has prevented the completion of a few tasks, however as soon as it melts we will be able to finish the final stages. Even though we were waiting for a further three team members to arrive, we survived the first visits from yachts and ships. Sarah delivered the Habitat Restoration presentation to all the ships with Matthew and I helping out, learning a great deal about this incredible feat. Matthew believes living on SG and being the Museum Curator will be an excellent opportunity to develop his professional skills and to share the amazing SG story with its visitors. He is also keen on improving his home baking skills for the ship expedition team members who come into the staff tea room for a coffee break when onshore. Every morning when I raise the blinds, I am excited to see what living on South Georgia has to deliver. I wake to the noise of elephant seals, king penguins, Antarctic terns and the odd gentoo penguin trying to find his friends. We have had king penguins wander between the buildings in Grytviken and a young male elephant seal snooze beside the Slop Chest. We have had days where it has snowed two feet overnight and we were excited like young children on Christmas Day. We are so fortunate to have this opportunity to live and work here for the season and are both incredibly excited for what is yet to come. This page was last modified 18:59, 23 November 2015. This page has been accessed 5,347 times.